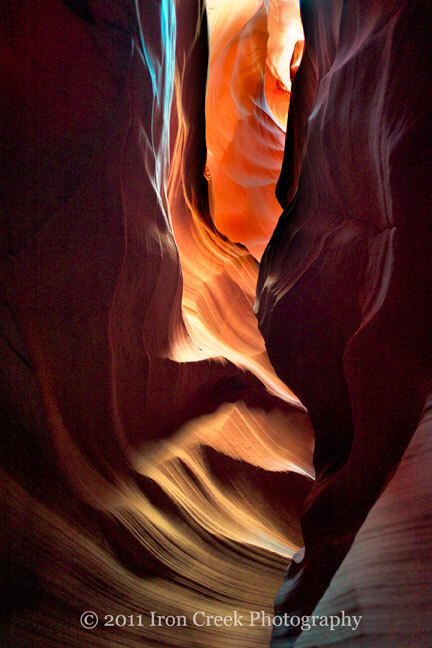 A slot canyon is a narrow canyon formed by water rushing through the rock. 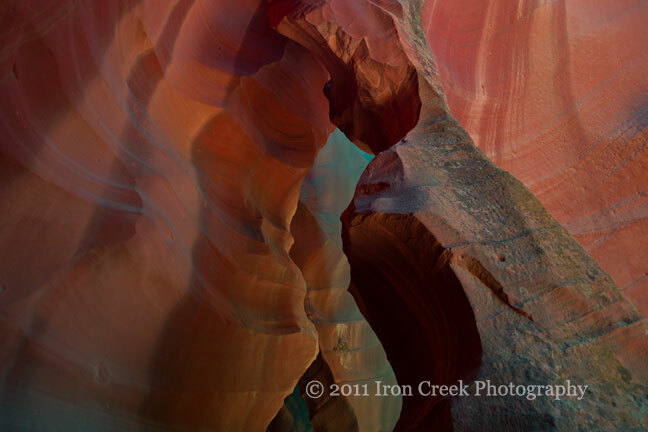 Slot canyons are deeper than they are wide and extremely beautiful and dangerous. The top of a slot canon can be less than 12" wide while 100 feet deep and range from yards wide to less than 12" wide at the bottom. 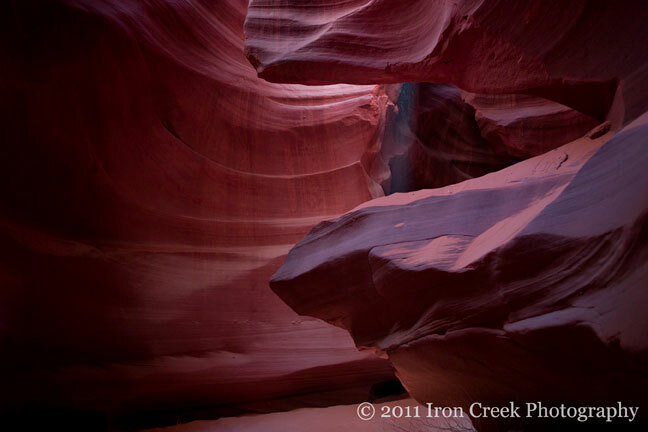 Slot canyons be very easy to enter or very difficult - it all depends on the way it was made. 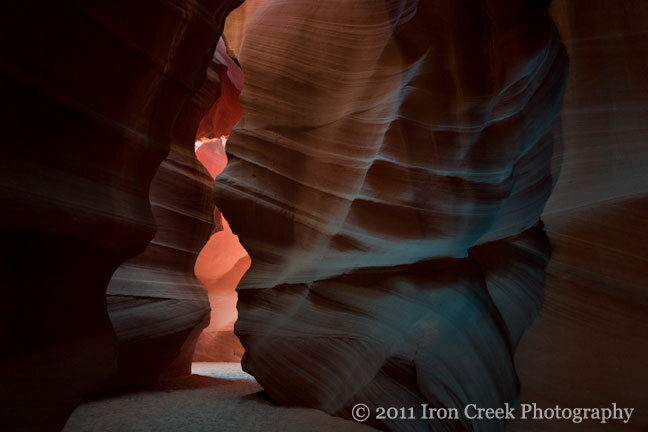 Most slot canyons are formed in sandstone and limestone rock although some are granite. Utah happens to have the largest concentration of slot canyons in the world and can be found in Zion National Park, Bryce Canyon National Park and the Grand Staircase-Escalante National Monument. 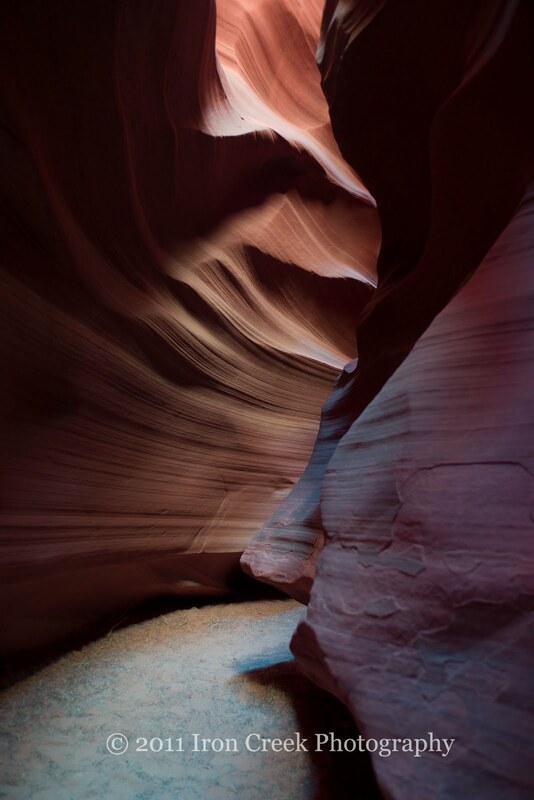 Buckskin Gulch, the longest slot canyon in the world is located approximately 30 minutes north of Page AZ. 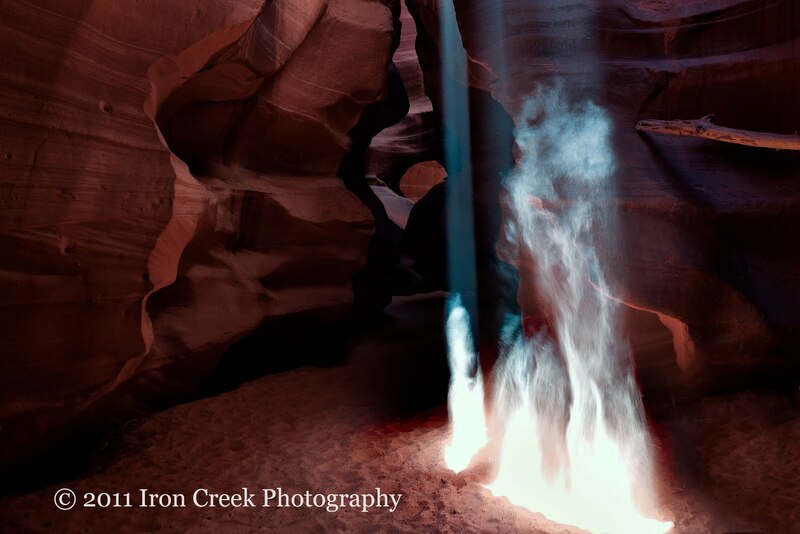 There is a significant danger of drowning in a slot canyon, distant storms can cause flash flooding in slot canyons (which is the main method of formation). One needs to look at the weather not only in the immediate area but the surrounding area as well; if rain is called for do not enter a slot canyon. Slot canyons normally offer only one way in and one way out; it can be dry as a bone in the slot canyon however if you hear what sounds like a locomotive coming - it's too late. Please heed this warning. 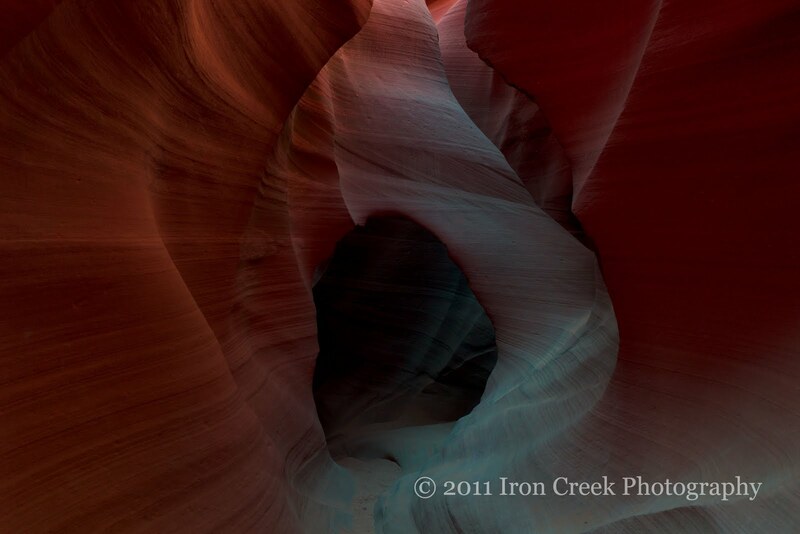 Okay we've discussed what a slot canyon is and how dangerous they happen to be. 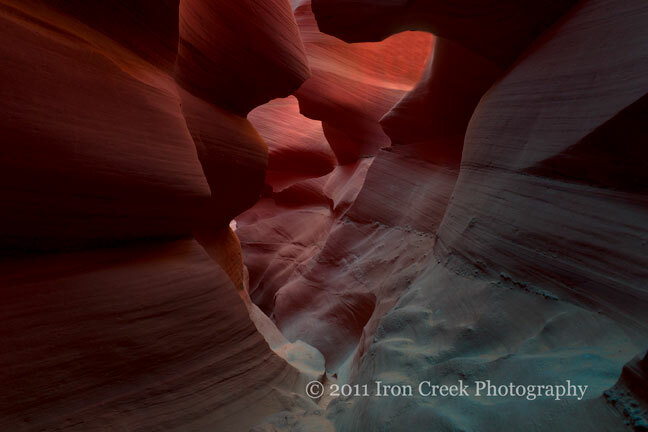 A typical slot canyon can be stunningly beautiful and that's why I like to photograph them. 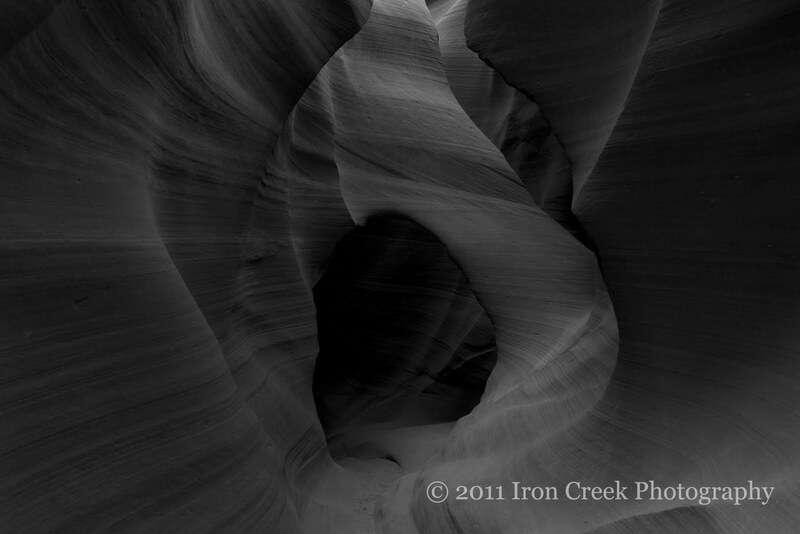 It's been several years since I last went into a slot canyon; so long in fact I no longer have the camera I used to capture the images. 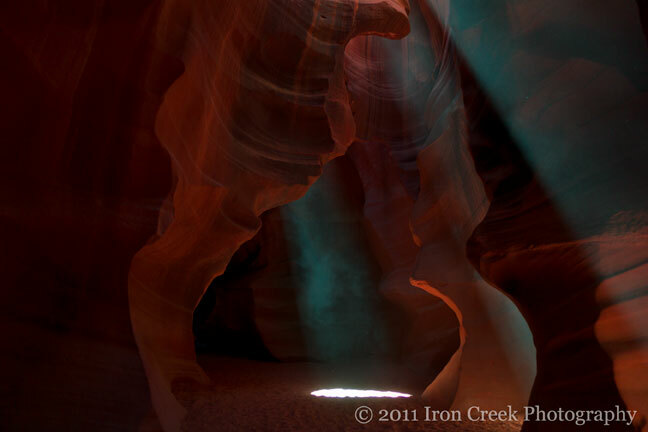 Ken Doo and I had been talking about meeting in Page AZ to shoot slot canyons for several months. This seemed like a very good idea as it would give me the chance to see what I could capture using first a rangefinder camera (Leica M9) as well as a technical camera (Cambo WRS1000/P65+). 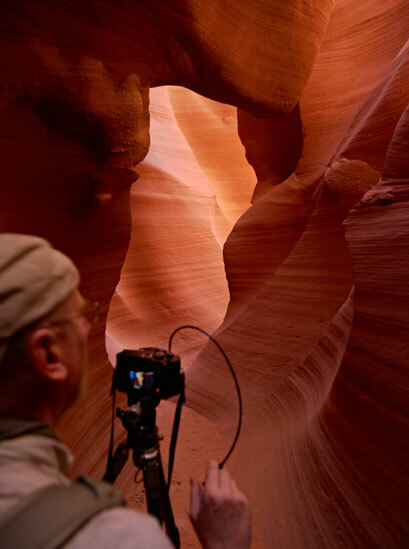 The very first piece of photographic equipment one needs to capture images in a slot canyon is a tripod as your typical capture will be several seconds long and you want to avoid camera shake. The second on the list is a remote shutter release as you want to try not to touch the camera any more than what you have to. The third is the camera. Please note you'll be in a dark environment and the first instinct will be using a flash. While you may certainly use a flash the colors will be washed and you'll end up wondering why your images don't look like those you've seen other places. The images posted here were all taken using a Leica M9 and a Leica Elmarit 24mm lens. I kept the ISO as low as I could and opened the f/stop and shot slow. 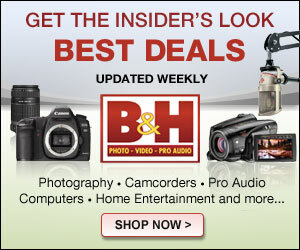 Using a rangefinder camera is different from almost all other types of cameras. 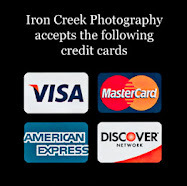 It isn't a point-n-shoot where you have this large screen on the back to help you focus and frame the shot. Neither is it a DSLR or type of camera where you hold it up to your eye and look through the lens to frame the capture; neither are the lenses autofocus. A rangefinder type camera such as a Leica M9 is very much an old school camera system which has a digital capture ability. The way to properly focus the image is looking through a small viewfinder where you'll find a box within a box. Using this series of boxes you turn the lens until both boxes are aligned together and you see a clear, sharp image; once you have that all you need to do is activate the shutter. Of course there's more to it than that. A typical rangefinder camera is totally or near totally manually operated with manually operated f/stop and shutter speed. 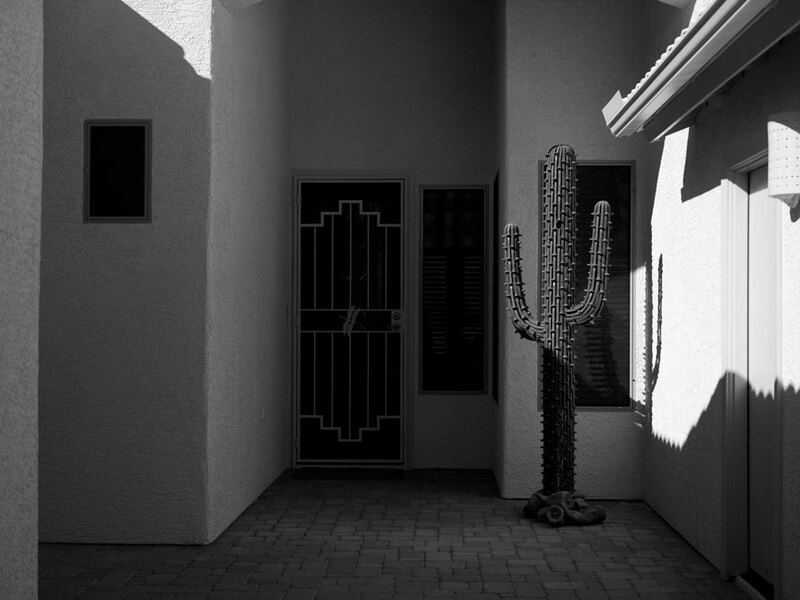 A rangefinder camera is the type of system that is almost as slow to use as a tech camera and that's why I like using it. 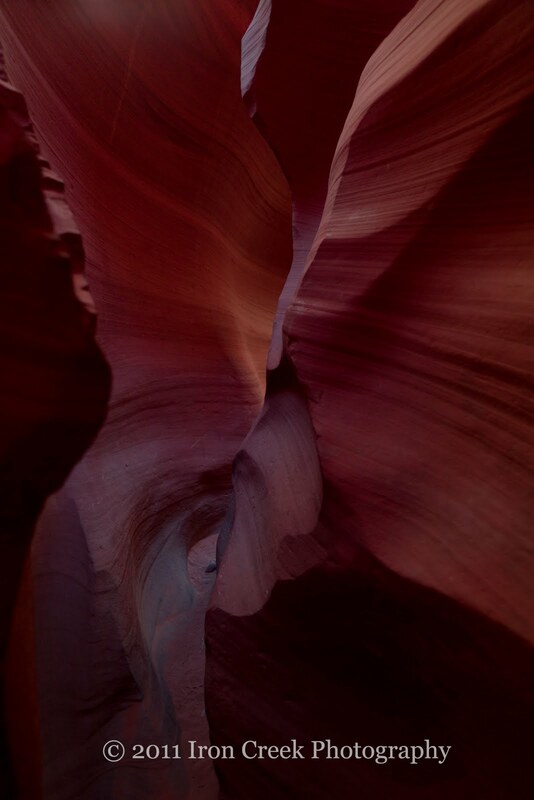 My thought about using the M9 in slot canyon was how well will it hold up. Will I be able to achieve critical focus. And could I keep up with Ken shooting side by side as he used his Phase One DSLR and new IQ180. In the end I was pleased. The next edition will discuss using the Cambo WRS/P65+ in a slot canyon. Let me know if you have any questions, comments or suggestions. 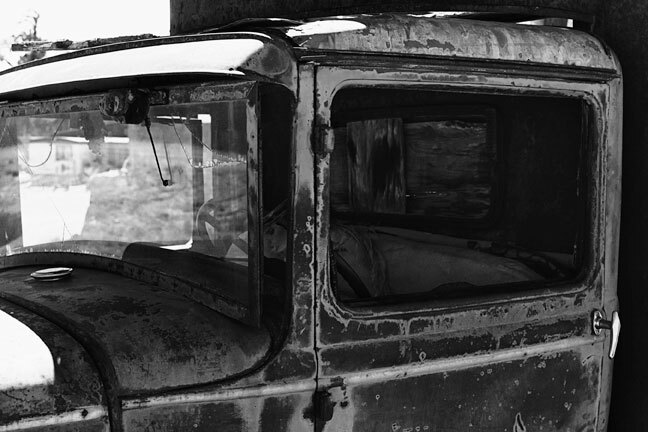 I had the pleasure of exploring the area in and around Bluff Utah recently. I've been photographing this area for several years however until recently I've never taken the time to really explore the area. 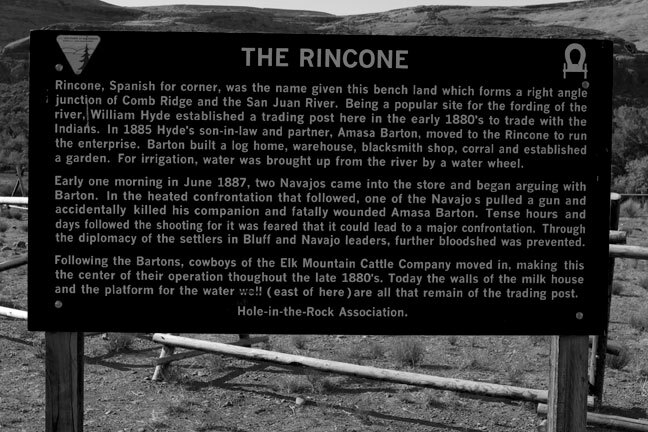 While I have photographed the landscape of Comb Ridge, Valley of the Gods, and Monument Valley I haven't had the time to dig deeper into the rich history this area offers. The more I explored the history of the area the more I knew I wanted to return and spend some quality time exploring the area. 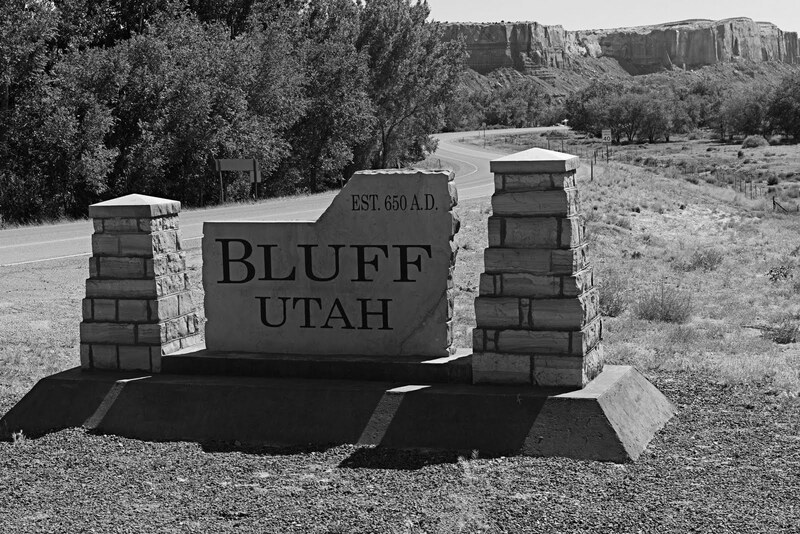 Bluff is a small town located in the San Juan River Valley in southeastern Utah. US Highway 191 runs through the small town which is bordered on the south by the San Juan River as well as the Navajo Nation. 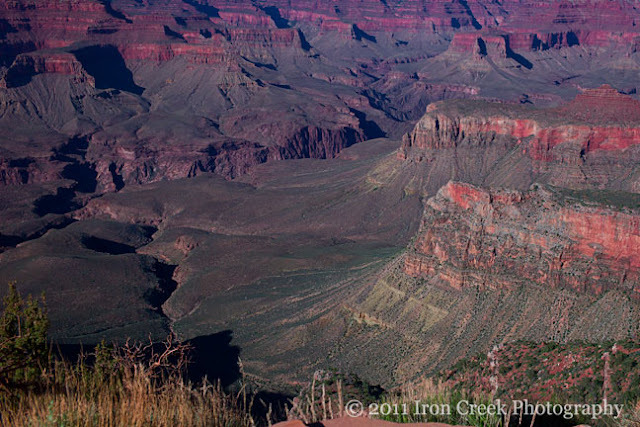 There's vast panoramic landscapes to the west and 300-foot sandstone bluffs to the north. Monument Valley is a very easy drive to the west taking less than 45 minutes to get there while passing through incredible southwestern landscape. 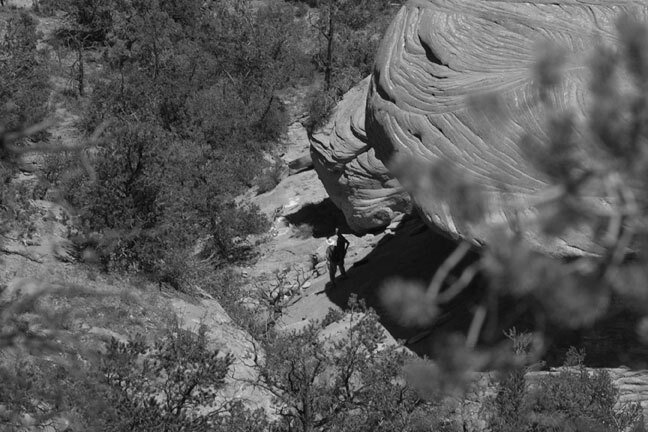 I wanted to explore the Cedar Mesa area on this trip. 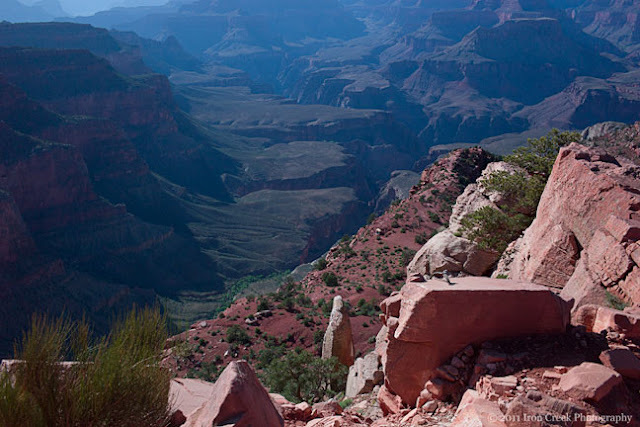 There's an elevation change ranging from 4,200 feet (1,00 m) to 6,500 feet (2,000 m) which helped lead to the formation of numerous canyons and cliffs. 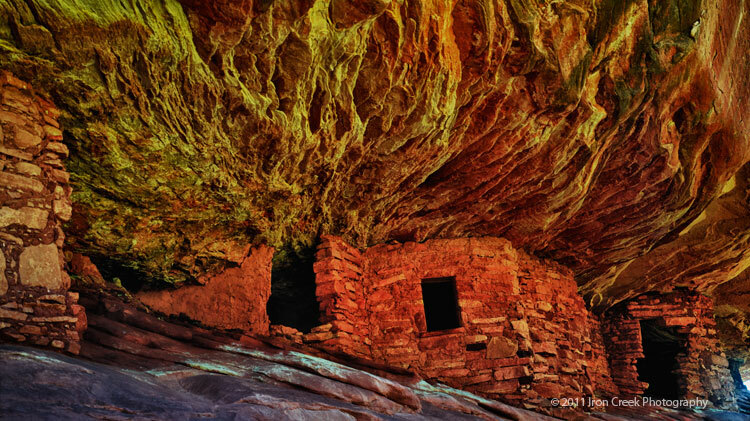 There are several canyons leading into Comb Wash, including Arch, Texas, Owl, Fish, and Mule with cliff dwellings of the Ancient Puebloans scattered throughout these canyons. 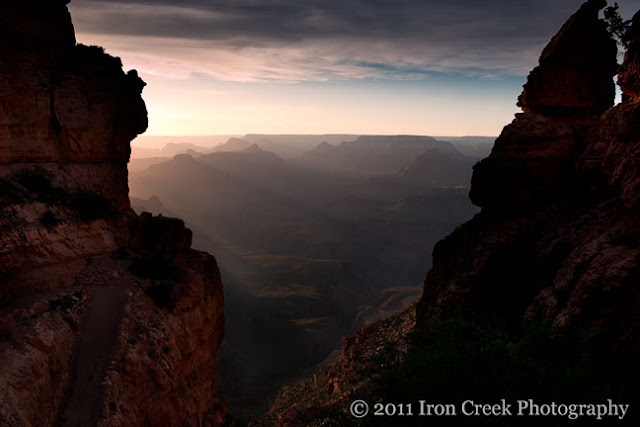 With so much to choose from I decided to center my visit on the Mule Canyon area. 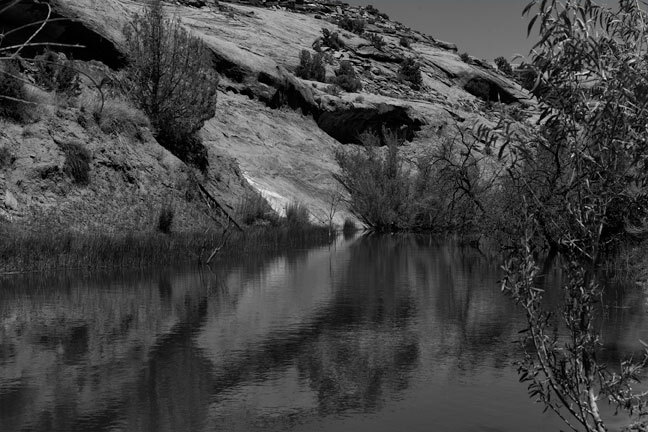 Mule Canyon is located north of Bluff and off Highway 95. The main attractions of Mule Canyon are the Anasazi ruins, petroglyphs and outstanding scenery. The trailhead is approximately 3/10 a mile off the road. I paid my $2.00 for the Cedar Mesa day use fee and found the trailhead. After signing the register I began my hike to the first ruin which is slightly less than one-mile. 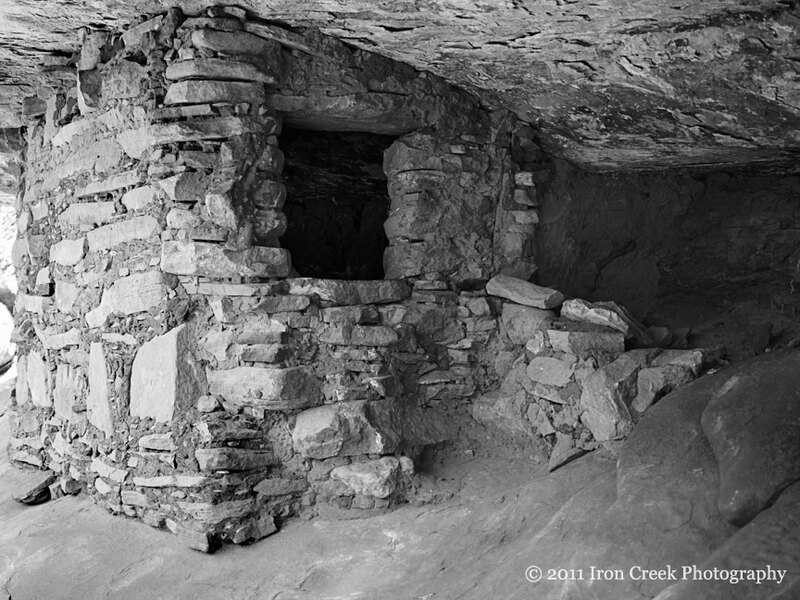 There's more than 4-cliff dwellings located along the trail within a span of approximately 3-miles. The first ruin is called "House on Fire" and is aptly named. 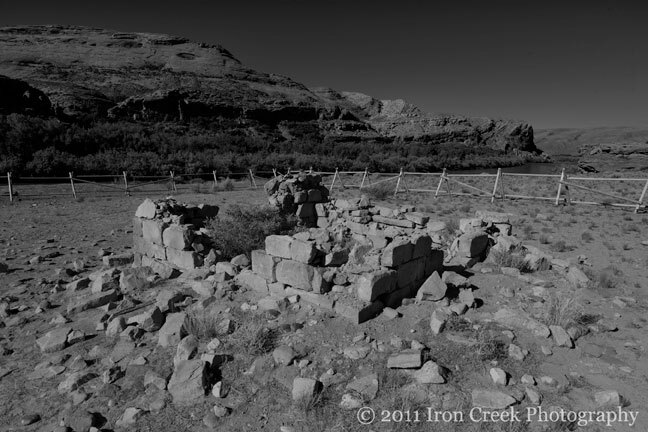 This ruin sits less than 30 yards off the trail and is easily accessible. My research told me the best time to photograph this ruin was between 10 and 11 a.m. I wanted to get there early to set up and found that I ended up staying here for over 5-hours; mostly by myself. The original plan was to photograph this ruin then continue down the trail stopping at the other ruins along the way until the end before turning around. Notice I said the "original plan". I ended up hiking out to the next ruin which was about 1-mile away however by the time I got there it was in the heat of the day and I was simply too pooped to try the climb to the second ruin; I looked at it from a distance and decided to return to the truck. All told I found myself on the trail close to 8-hours and while I didn't do what I had originally expected to do I had a ball. I've talked Sandy into joining me on a return visit next year sometime late spring when the weather will hopefully be cooler. 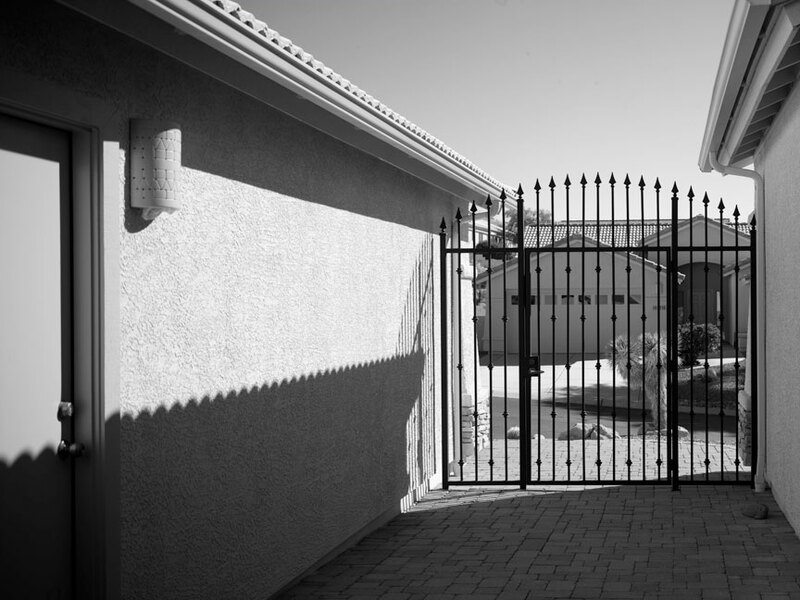 The images shown here of House on Fire were all captured using the Cambo WRS and Phase One P65. This was also the first time I had decided to use a lighter weight tripod and ballhead and am very pleased with the way things turned out. I had recently replaced the original grips of the WRS1000 with the new wooden grips and can report the change helped. I like the wooden grips so much I actually attempted handheld photographs a few times and liked the results. My second day in the area and I woke a little sore from the hike yesterday so I decided to try and explore using the truck more than my feet. 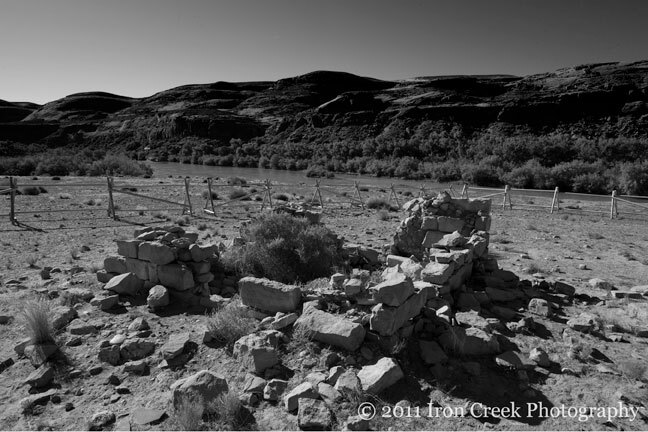 I made it out to the remains of Barton Trading Post located along the San Juan River. Further out is The River House ruin which I found sitting on a high cliff. I started climbing to the ruin however I quickly found that it was too steep for me and I really needed more than 12-hours to recuperate from the previous day. The first image above is from an overlook off Highway 95. I walked out to the rim hoping to be able to see where I hike the day before and maybe see at least the first cliff dwelling. The second image is where I suspect "House on Fire" is located (at least that's where my GPS said it was). If you look close enough you'll see 2-people standing near the rock face. 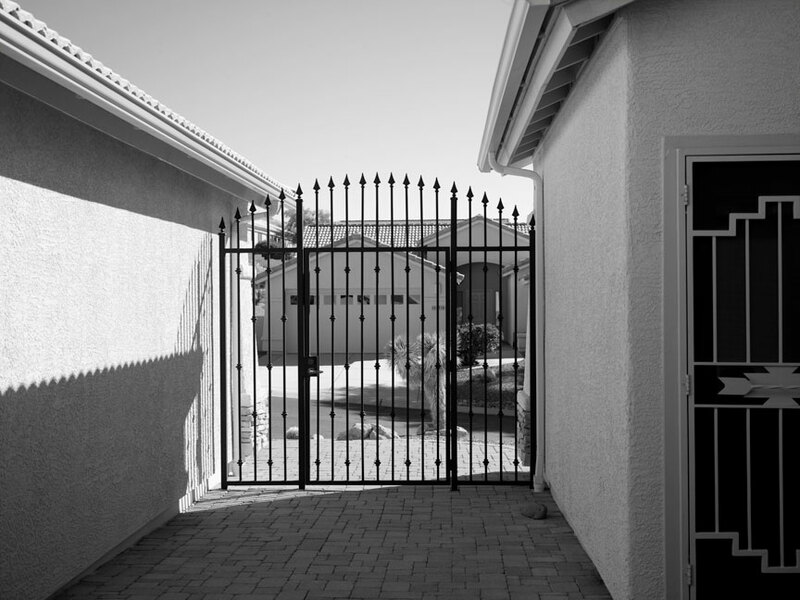 The 3-image is a 100% crop of the second image. 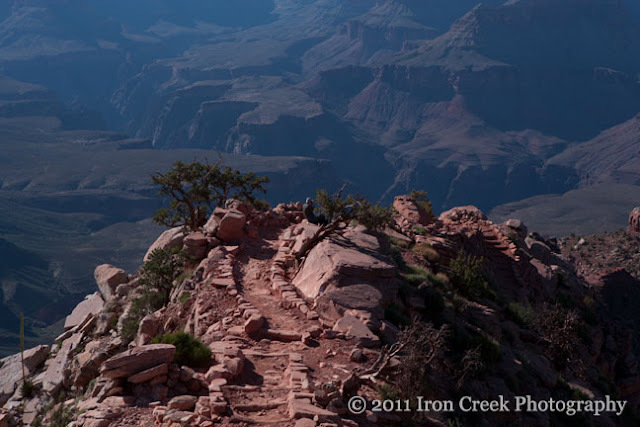 I never did get to walk around the rim to get a better look as there was little to no trail and it got more difficult the further I walked. 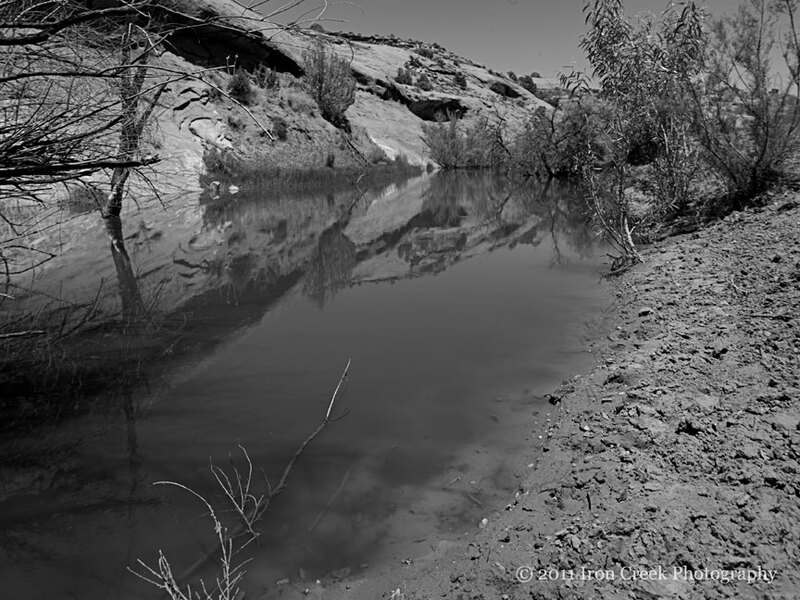 I passed this waterhole on the way to Halls Crossing and decided to stop on the way back. There's really isn't much to it; shallow water, hoof prints in the sand, flies - big flies. Lots of flies. 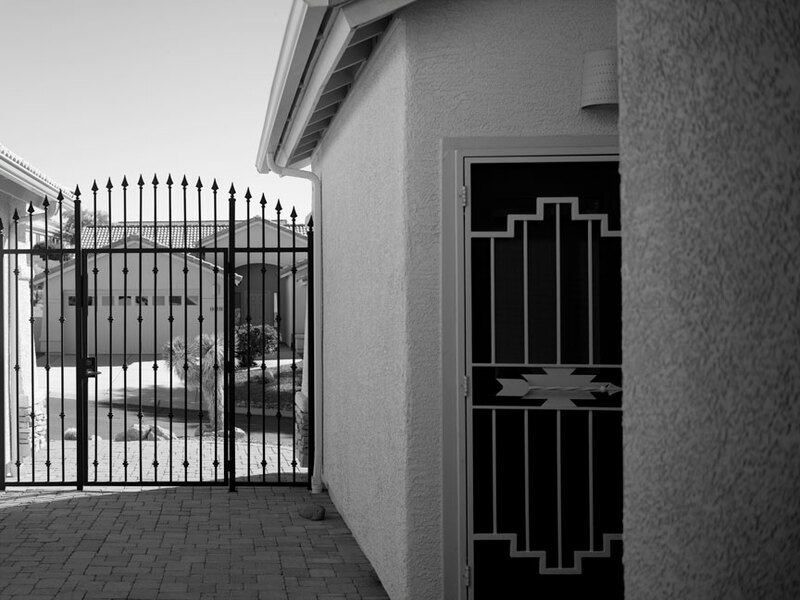 I took the first image with the Leica M9 and 24mm and deciding I like what I had deciding to break out the Cambo WRS/P65+ with the Schneider 35mm. The Leica image was handheld while the Cambo was on tripod. Deciding I was still too tired to do any actual climbing I decided instead to take a drive and see the scenery ending back on Highway 95 and eventually Halls Landing in Lake Powell. I had planned on taking the long way around the next day leaving Bluff for Page AZ where I was meeting Ken Doo to shoot slot canyons and wanted to see the area in advance. 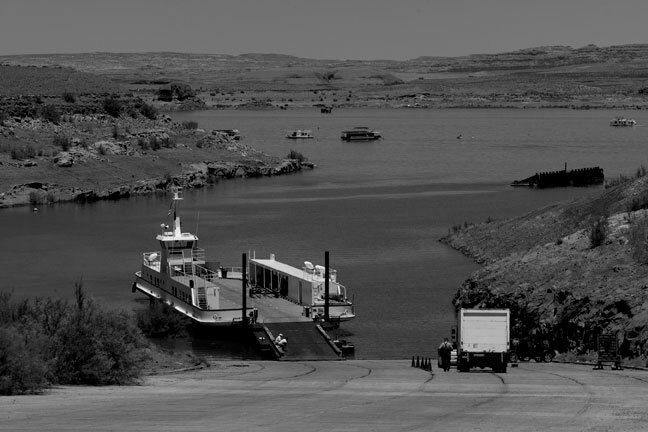 I ended up driving to the ferry before turning around and returning to Bluff. 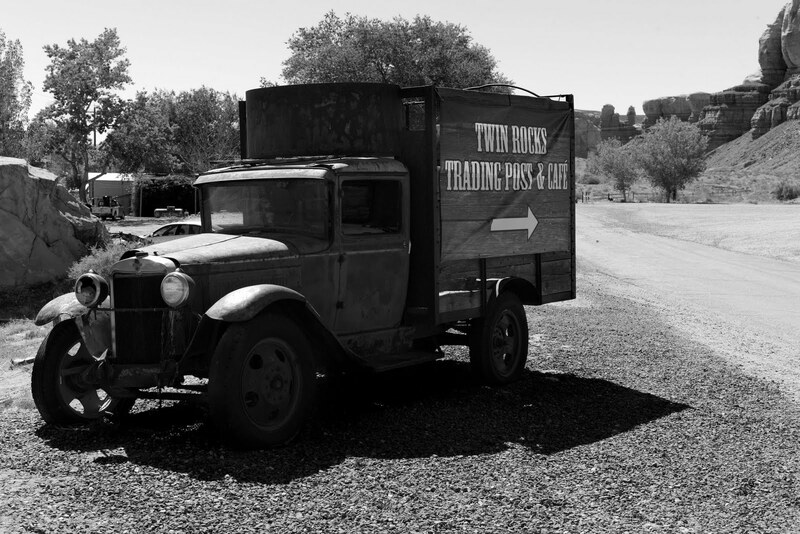 A great place to eat in Bluff is the Twin Rocks Trading Post & Cafe. I left the next day working my way through Valley of the Gods, Gooseneck State Park and passing through Monument Valley on my way to Page. I met with my 'brother from 'another mother" Ken Doo in Page where we spent 2-days shooting in slot canyons and attempting to see just how much sand we could get in our boots. I stayed at the Desert Rose Inn & Cabins while in Bluff and highly recommend it. 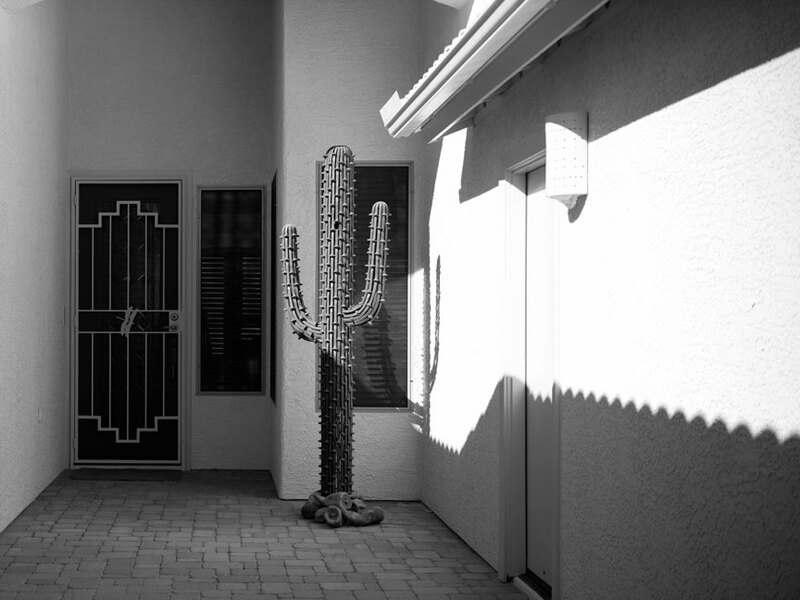 Sandy & I like the Desert Rose so much we'll be staying there as we make our way to Jackson Hole later this year. I've been home long enough to process and print the "House on Fire" at 30x40 and have to say that I'm very pleased with it - so much so that it will shortly be hanging in our studio. 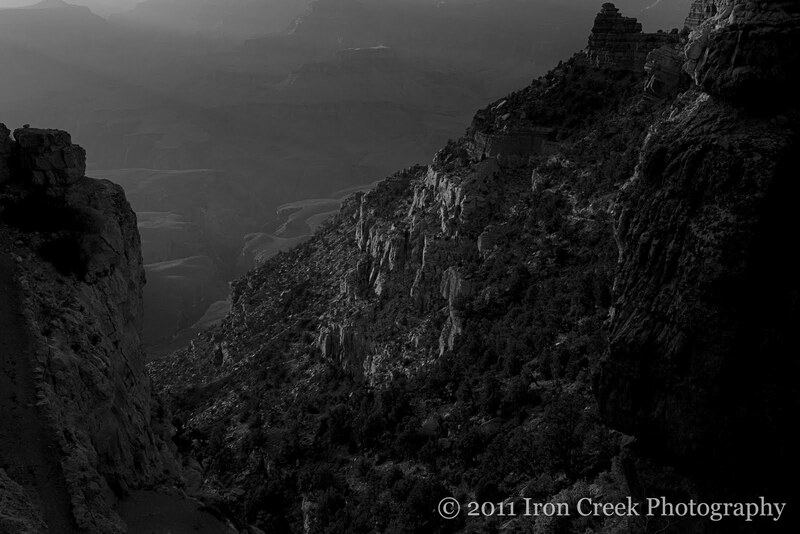 Next up is Page AZ and slot canyons captured using the Leica M9 and the Cambo WRS/P65+. Thanks for visiting and as always, your comments, questions, or suggestions are always welcome. I'm still in the learning stages of what my new P65 will give me and decided to test it with the Schneider 72mm lens. This test provided a dual purpose as I want to see what 15mm movements will give me in the field and I wanted to see if I could save some money. I've been successfully using a trio of lenses for several years and wanted to see how they will perform to the new back as well as find out if it was time to introduce a new lens into the mix. I've been using Schneider lenses in 35mm, 72mm, and 120mm with the P45+ and by using movements was able to achieve a much wider perspective that what a single capture would give me. 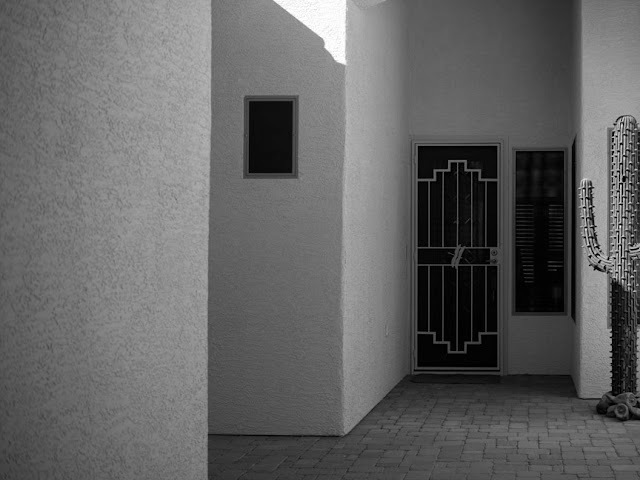 I recently started thinking of adding a focal length somewhere in-between the 35 and 72mm and had thoughts of a 47mm. So the question I had was could I save money using my 72mm at 15mm lateral movements. 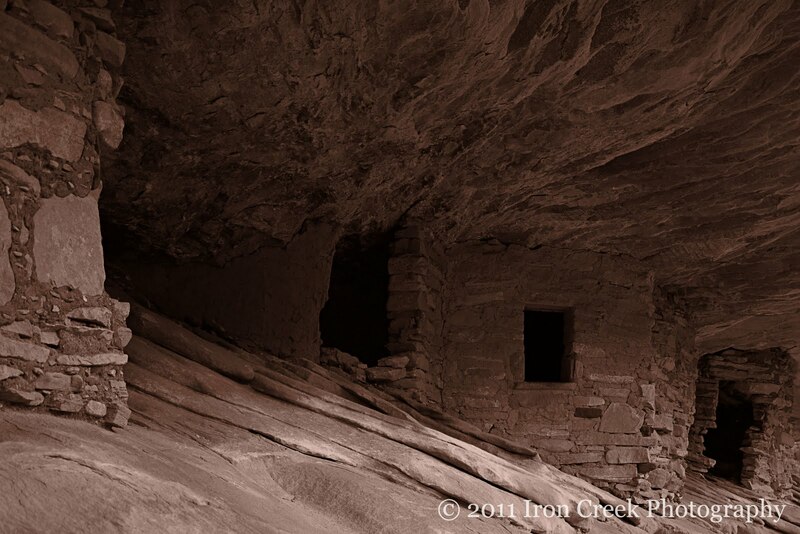 The main question is how will the 72mm work in tight and semi-tight areas; inside slot canyons or a cliff dwelling. Having no better place to test my theory I decided to use the courtyard to our house. 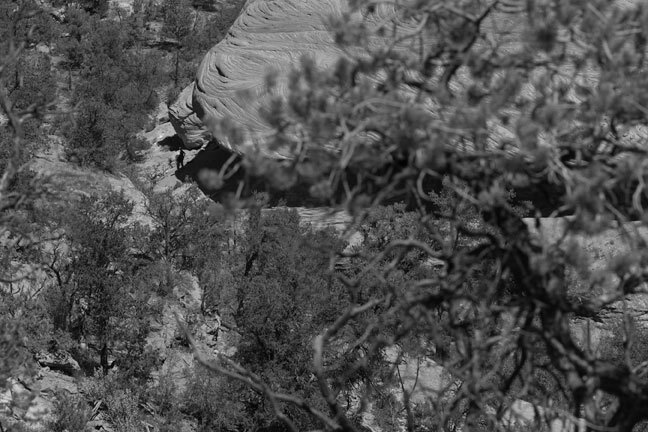 The length is approximately 30' with the width varying from 10 to 15'; sounds like a slot canyon to me. I could have used 10mm movements however I had used 15mm with the P45+ and wanted to see what if any damage there'd be. The testing I've done prior to this when I first started with the P45+ showed I can successfully shift my 35mm out to 10mm, the 72mm to 15 and the 120 all the way out to 20mm. Now to the images themselves. I converted all to black and white to better show the corners. I also notice little to no color shifting with the movements however if I were shooting these movements for anything other than black & white I would shoot the standard LCC prior to each image capture. 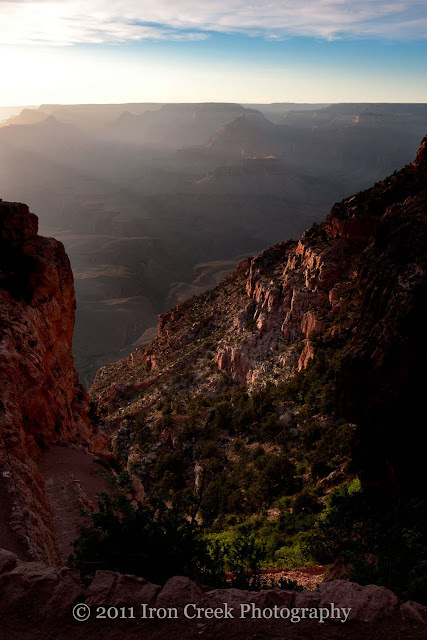 The bottom line with this test is that I've become more accustom to the back and lens and feel I'll have no problems using it while I crawl around cliff dwellings or slot canyons. I also found I still don't really need that 4th lens as I can achieve the focal length desired using this method. I plan to use this lens next week as I spend a couple days shooting in and around Anasazi ruins and slots canyons of southern Utah and northern Arizona. I believe continually testing my equipment with the thought that the more I test the better I understand what it'll do for me in various circumstances; with that in mind stay tuned for more to come. Please contact me if there's a test you'd like to see that I haven't done yet. 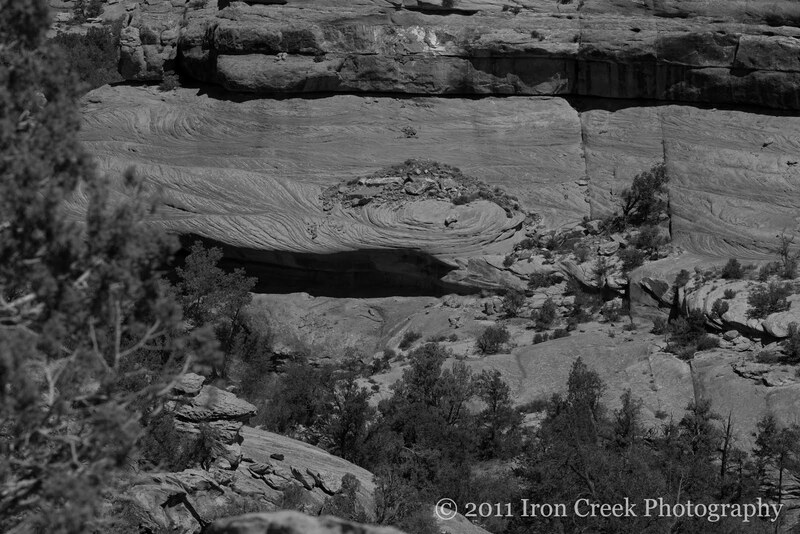 The trail begins south of Yaki Point on Yaki Point Road. The trailhead elevation is 7,200 feet and goes straight down, or at least it felt that way. At .9 miles you reach 6,320 feet and arrive at Ohh Ahh Point. Going just a little over 1/2 mile further takes you to an elevation of 6.060 feet and Cedar Ridge. We've been wanting to take the hike to Ohh Ahh Point for many years however it wasn't until Don got his Leica M9 that we actually decided to do it. We checked the weather a couple weeks ago and found while it was forecasted to be in the 100's with no clouds at home, the South Rim had clouds and temps in the 70's. We found we were able to get a room and off we went. 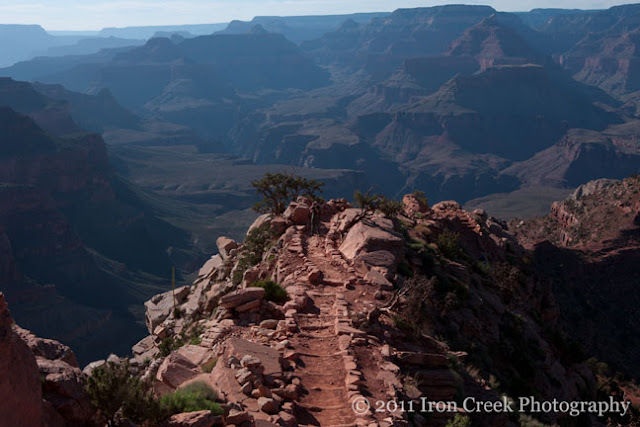 It's one thing to say a trail is steep and offer elevation changes; it's another to actually experience it. 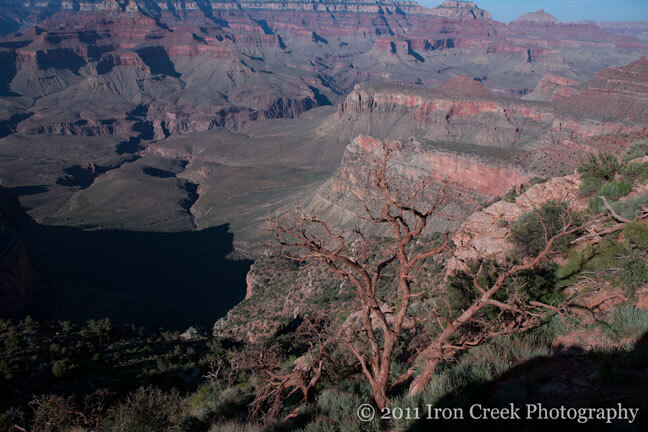 There's several stretches of trail where going downhill you feel your toes sliding in to the toes of your boots. There's one (or was that more than one) stretch where it was actually harder to walk downhill than it felt coming back. While going down the trail is (slightly) easier you must take it slow as it's easy to become that snowball running amuck downhill gathering speed as you go. Don's been researching this trail for sometime and this trip seemed to be the perfect time to attempt it. His first thought was to pack his tech camera which needs a sturdy tripod thinking 1-mile should be doable. Going uphill. Then reason took over and he decided to make the first trip with lighter gear thus packing the Leica M9 and picking only 2-lenses (35mm and 50mm) along with a spare battery and water. Sandy on the other hand packed her 1DsIII and 17-40mm lens and water. You'd think hiking 1-mile downhill would be easy and fast - we found it was the opposite. It took us just slightly over an hour to reach the area directly over Ohh Ahh and that was with just one rest/photo stop. We found that we were constantly attempting to keep our downhill speed slow enough where we didn't begin to "snowball", besides we wanted to enjoy the scenery. Don had a vision that Ohh Ahh Point was going to be a large area along the trail that afforded vast vistas. He was wrong. 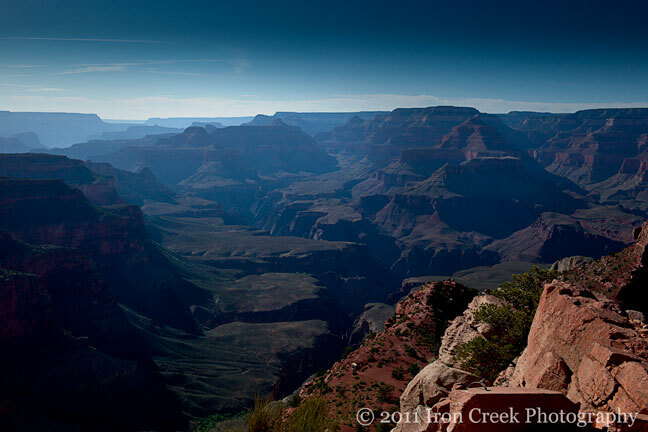 Ohh Ahh Point does offer stunning views of the Grand Canyon. However there's no signage telling you've arrived. 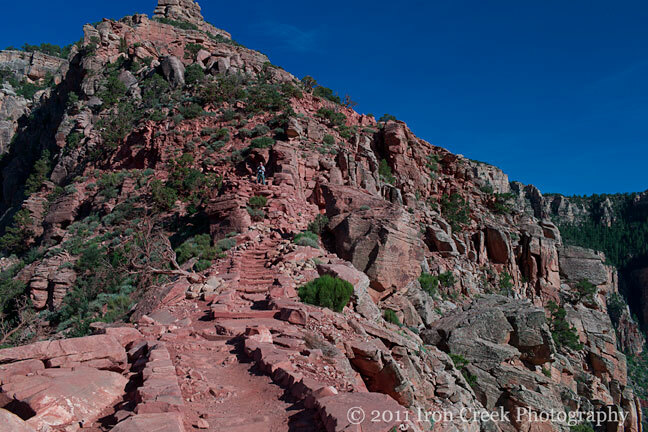 Likewise there isn't a great expanse of space where you can set up a tripod without being on the actual trail. There's an area at a bend in the trail where you'll see Cedar Ridge in the distance (looked closer than 1/2 mile) then following the trail downwards (less than 1/4 mile and a drop of approximately 200') is the space we decided was Ohh Ahh Point. Sandy stayed above as Don went further down the trail to this point where he found several large flat boulders with wire cables attached. This became Ohh Ahh Point for us. If someone reading this knows differently please let us know. We began our climb out after staying in the area several minutes and meeting folks as they were returning from Cedar Ridge or from the river itself. Taking our time and stopping often we made it back to the trailhead in about 2-hours after we began the trip back. Something we hadn't discussed until now was the actual time of day we did this. 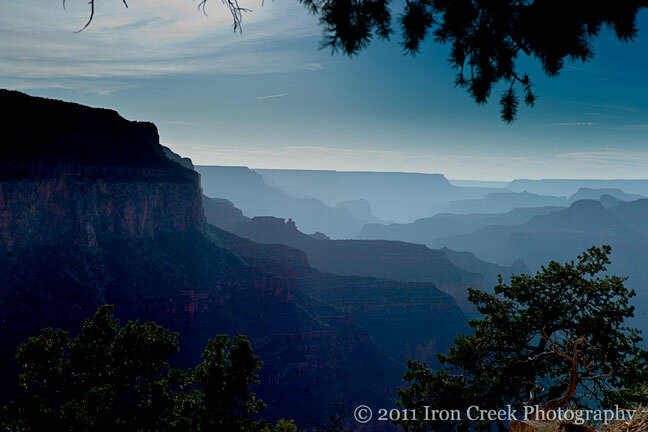 We left home for the South Rim Tuesday May 31st getting there in the early afternoon. We checked into our hotel had lunch and decided that since the weather wasn't hot and the skies were cloudy we'd try the hike in the afternoon instead of the following morning as planed. So off we went in the heat of the day; which due to the conditions wasn't all that bad. We cleared the GPS at the bus stop and began the hike down getting to Ohh Ahh somewhere between 1.1 and 1.2 miles which made the round trip closer to 2.3 to 2.4 miles. We also got to the top several minutes before sunset. We were back on the bus headed for the Visitor's Center and our truck just as the sky was turning red. Don is planning a return trip later this month on his way home from Page and plans to do this all over again (weather permitting) only this time going to Cedar Ridge packing his WRS/P65 so stay tuned. As always we'd like to thank you for allowing us to share and please remember your comments or questions are always welcome.